The Mayor in a tweet accompanied by a photo of the proclamation said, “proud to proclaim today Bob Marley Day in the City of Toronto. 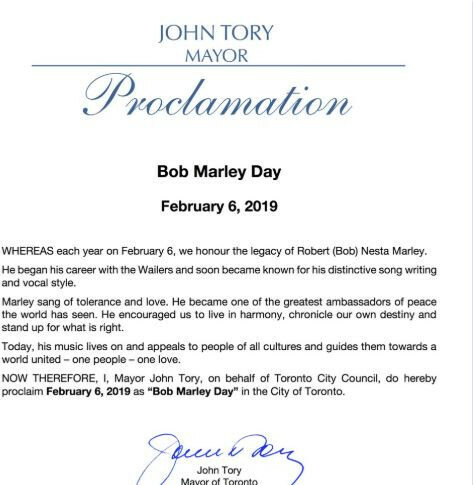 This Toronto tradition pays tribute to Bob Marley’s legacy of peace, harmony and the unity of humankind. His music lives on today and is a guide towards a world united one love”. The official statement reads, “Whereas each year on February 6, we honor the legacy of Robert (Bob) Nesta Marley. He began his career with the wailers and song became known for his distinctive songwriting and vocal style. “Marley sang of tolerance and love. “He became one of the greatest ambassadors of peace the world has seen. He encouraged us to live in harmony, chronicle our own destiny and stand up to what is right.